Y'all, Memoria Press is also so extremely generous when it comes to crew reviews. This time around, we had a whole assortment of goodies from which to choose, including their Music Appreciation I. Mr. B and I received First Form Latin to review this time around. For this review, we received the complete set, which is everything you need to complete this course. 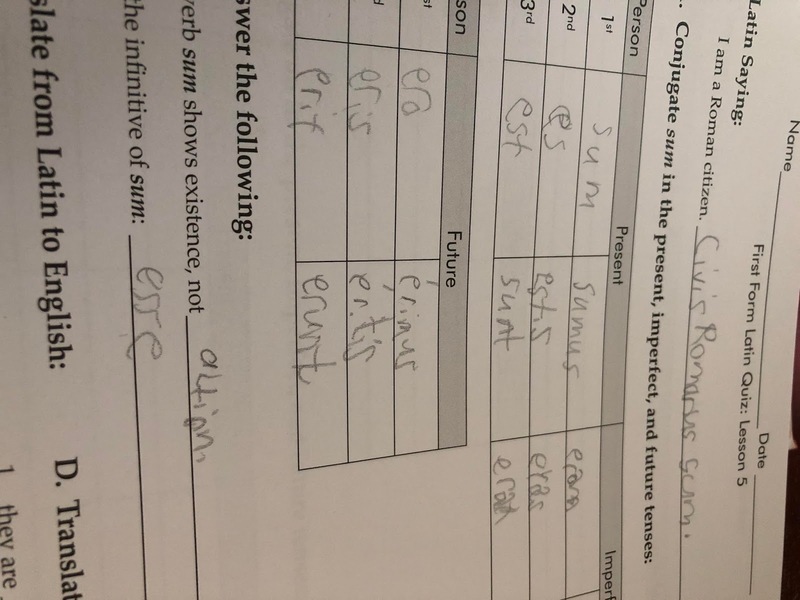 First Form Latin is geared for 4-9, and it's great as a first Latin for grades 6 and up. Mr. B has done Latina Christina in the past, so this was a natural flow right into First Form for him, but had he never taken a Latin before, this would be a great start for an older student. DVDs- There are 3 DVDs included that feature instructor Glen Moore. He goes through each lesson, step by step, making the course easy to understand and learn. 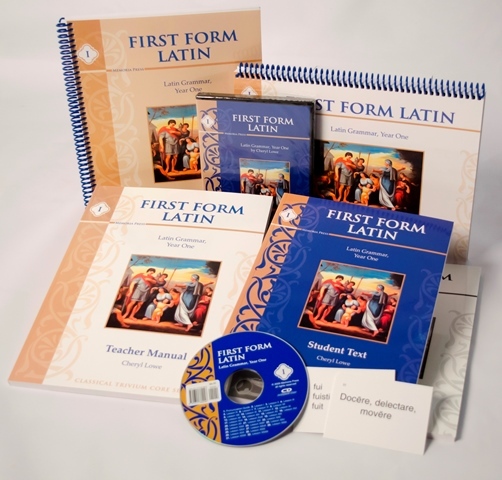 You don't have to have a background in Latin to help teach your child Latin because these DVDs take that role. Flash Cards: These are great for general practice, and they are already cut out for you to make for easy storage. Student Text-Written by Cheryl Lowe, this is probably Mr. B's favorite part. He likes to read through this, jumping ahead. This is a pretty standard text. It goes over the lessons with an introduction and a detailed overview of everything. It uses graphics and charts, and it is very easy to understand and use. Pronunciation Disk: I NEED THIS! HAHA! This is exactly what it says, shows you how to pronounce the words. Test and Quiz booklet: This has easy tear sheets so you can remove them for use following each lesson. There's a quiz for each lesson, and a unit test after each unit. Student Workbook: This has all of the lesson work in it. There's fill in the blank/charts, etc. There's reviews, an appendix, and several pages (4, 5, or 6) for each lesson. I love how there's ample practice!! Teacher Manual: This includes the entire student text inside with guidelines on how to teach this course. Basically, it teaches you how to teach the course, and I find it to be a 100% necessary component! 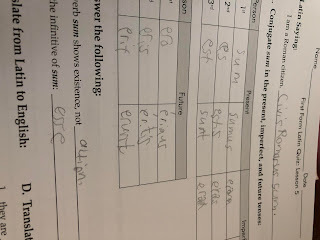 Never in a million bazillion years did I ever think I'd find myself teaching my child Latin (and learning with him!) but here I am, teaching my child Latin! He LOVES it. I was super surprised, years ago, when he took to Latina Christiana like he did. I was shocked to be honest. We had tried Latin at a couple of Co-ops and he hated it so much he would cry and beg to leave. We tried Memoria Press, and he LOVES it. He will ask to do extra lessons! I have to stop him so he will do his other work! Typically, we will watch the video first, and I will actually have him go though the Student Text as the video plays. We may watch the video two or three times just to make sure we understand. Notice I did say WE. After that, I have him work on a worksheet. We typically move kind of slow through this, and it may take us a few days to actually complete a lesson, and that's totally ok with me! Some lessons we even watch the video every day, and only do a worksheet per day. So, a lesson could take us a week or so to finish fully. Om Fridays, I typically pull out the corresponding flash cards and we do drills, and we add new cards from the new lessons and add those to the older lessons, so we are always covering what has already been taught. Overall, this is exactly what you've come to expect from Memoria Press-A great quality program that is easy to use and easy to teach. Mr. B loves it, and we have found it is easy to adapt for special needs. I highly recommend this!